• Paint the hand in the color you want your tulips to be. 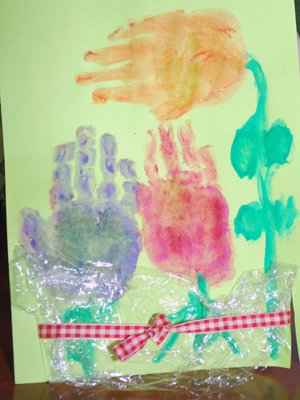 • Press the hand down onto the sheet of construction paper to make tulips. • Using the paintbrush make the stems and the leaves of the tulips. • Let the flowers dry. 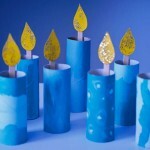 • Using scissors, cut 2 vertical slits on the bottom of the paper. • Put the ribbon through the slits, in the back of the paper. • Put the plastic wrap on the bottom of the picture and tight the ribbon around it to make a bouquet.